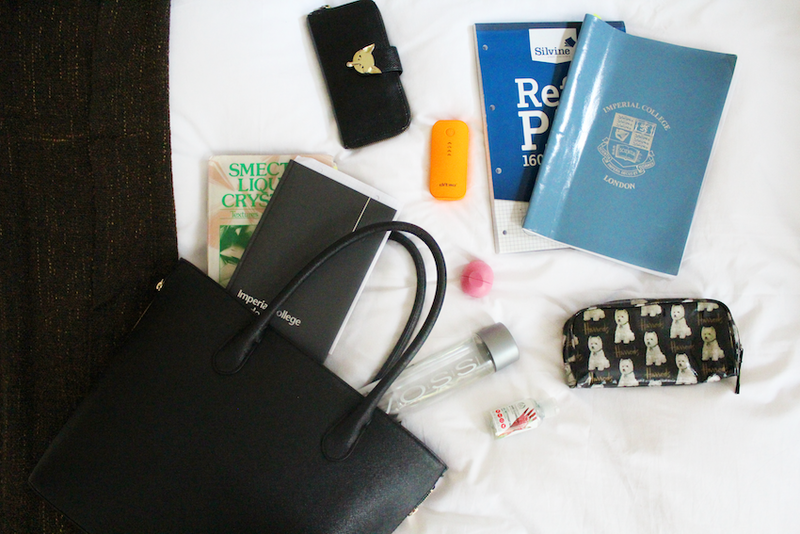 WHAT'S IN MY SCHOOL BAG! | RAWR BOWS. Whilst most people went back to school like a month ago, I only started last Monday. Thus the lack of school-related posts. When everyone is in the back to school mood I’m like ‘let’s go to the beach and get drunk’. I feel like it would be a bit pointless to do a ‘back to school post’ now since it wouldn’t be too relatable. 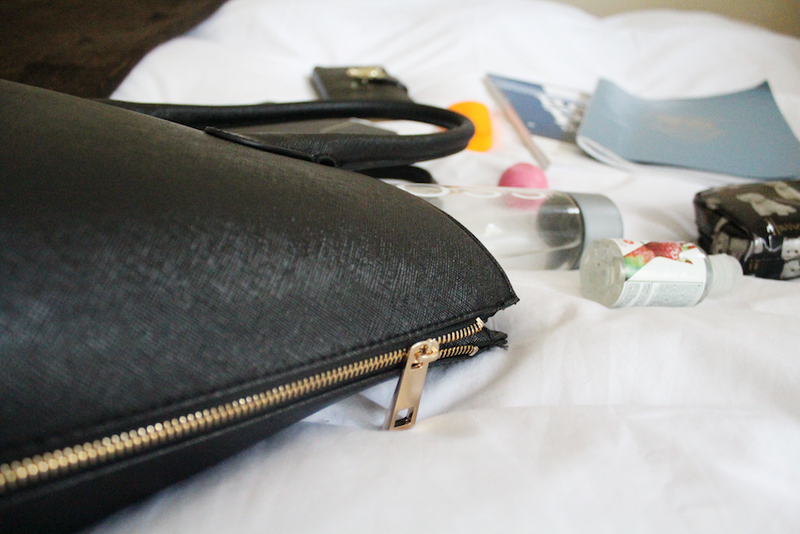 However, it’s always the right time to do a ‘what’s in my bag’ post, amirite? I decided to this now, before my school bag gets full of crap (which is going to be really soon). My bag is this black tote from H&M. It was quite cheap (around £30) and it's massive so I can keep everything I need - the only issue is that my arms are not too strong so sometimes it's a real struggle to walk to uni and back. Nevertheless, I absolutely love this bag, especially the gold details on the sides. Let’s start with the boring stuff. I have my lab book to keep all the data from my experiments, a refill pad to write my notes, my laptop (not in the picture, I was listening to music sorry) and a book from the library that explains the theory behind the experiment I am currently doing. In case you are curious and have no idea what smectic liquid crystals are, I’m sorry but neither do I YET. Ask me in a few days and maybe I can help you. I also have my agenda where I literally write every single thing I have to do, otherwise I’ll forget. Plus, I like crossing things off - it makes me feel accomplished. Then we have my pencil case, where I keep all my pens and pencils (shocker!). I’m not a big fan of it since I don’t really like dogs (what kind of person am I?!) but I can’t be bothered to buy another one and it does the job. Something else I always have with me is my purse, where I keep my IDs and my cards so that I can buy food and I’m not starving all day. I also keep a bottle of water because I am trying to drink more water and I do actually get thirsty sometimes - not often enough though. 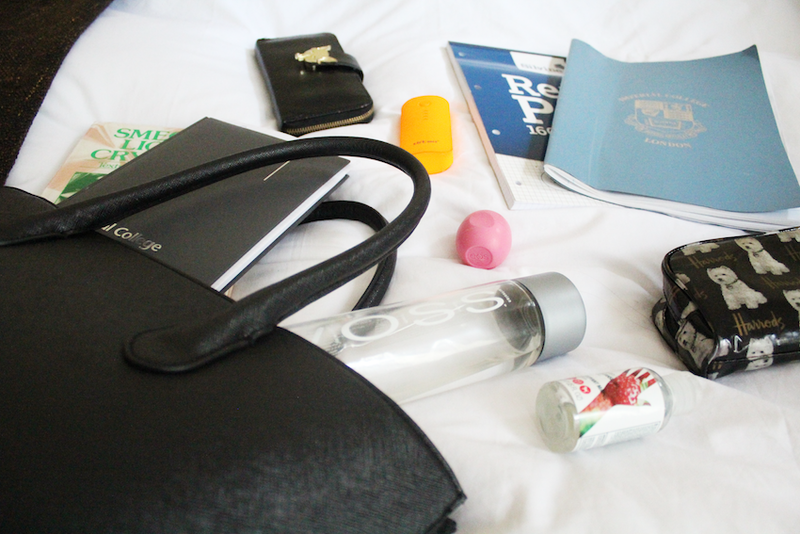 Lastly, I have my EOS lip balm, hand sanitiser and a portable charger -shoutout to my friend who lent it to me. Sometime I also have a roll-on perfume because, you know, gotta smell nice and fresh!